This light and fluffy lemon pancakes recipe contain more eggs and is higher in protein than traditional pancake recipes, making it a healthier way to start your morning, but the main reason to make these lemon pancakes is that they are absolutely delicious! I think that these lemon buttermilk pancakes topped with melted butter, a light dusting of powdered sugar, and a handful pomegranate seeds (aka arils) scattered over the top is going to become a seasonal favorite around here since the ripening of my Meyer lemons happens to coincide with the tail end of pomegranate season. After an amazing couple of days learning all about pomegranates and touring some local orchards with a bunch of fantastic food bloggers who traveled to Fresno from around the country for the opportunity to learn about one of my favorite local fruits, I have decided to incorporate pomegranate arils and juice into as many meals and snacks as possible this fall. I am so lucky to be once again living in one of the few places in the country where pomegranate trees grow in backyards, and this tour was just the thing to help re-introduce me to one of my favorite fruits from my childhood. I’ll write in more detail about the tour soon, but for now I’ll just tell you how I have been enjoying the fresh pomegranate arils (seeds) that were shaken from the pomegranates I picked yesterday. Mostly I have been eating them straight out of a bowl with a spoon—a delicious, healthy, and addictive snack. Then I discovered (thanks to Paula of Bell’Alimento) the wondrous combination of a spoonful of Nutella topped with fresh pomegranate arils! Last night I sprinkled them all over a bowl of Rocky Road ice cream—again, delicious. And finally, this morning, I sprinkled them over these beautiful, light and fluffy lemon pancakes. As far as I can tell, pomegranate makes just about everything taste better. And whether you have access to fresh pomegranate arils or not, I suggest you make these lemon pancakes. This morning was the first time I made them, but I think they will start making a regular appearance on my weekend breakfast plate. This buttermilk lemon pancakes recipe is adapted from Mark Bittman’s Light and Fluffy Pancakes in the book How to Cook Everything Vegetarian. I enjoyed them with nothing but butter, a light dusting of powdered sugar, and a handful of pomegranate arils. Don’t forget the side of bacon! In a mixing bowl, whisk together the flour, baking soda, and salt; set aside. In a separate bowl, whisk together the egg yolks, buttermilk, honey, lemon juice, and lemon zest; set that aside, too. In yet another bowl, whisk the egg whites (by hand or using an electric mixer) until medium to stiff peaks form. Pour the buttermilk mixture into the flour mixture and stir until well combined then very gently fold the beaten egg whites into the batter until mostly incorporated but some fluffs of egg white are still visible. Heat a griddle or pan to medium. Just before pouring the batter, brush the griddle with melted butter. Drop batter into pancakes of the size you prefer (I like mine 3 -4 inches across) and cook until the edges of the pancakes start to look dry. Carefully flip and cook until the other side is golden brown. Serve with butter and powdered sugar and/or syrup of your choice. *It's important that your liquid ingredients are at room temperature before whisking in the honey or it will seize and be harder to incorporate. You may substitute one tablespoon sugar for the honey if you don't want to worry about using room temperature ingredients, but I thought the honey was a nice touch. I love eating pomegranate seeds but I have yet to try sprinkling them on other things. I'm sure it would be delicious on anything. 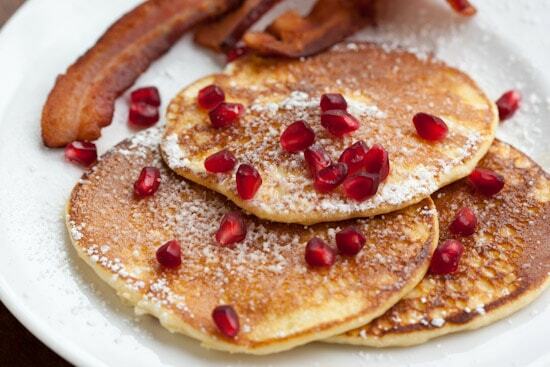 Those pancakes also look wonderful and the pom seeds add such a nice splash of color. How exciting you got to tour the plant! I have some POM juice the I have been loving at home, but I've never had the arils. These pancakes sound divine and I should surely try them! Thanks for the link! Love buttermilk in pancakes, chicken and cakes. Also am a huge fan of mascarpone pancakes. Those pancakes look so pretty with the splash of red. The lemon flavor sounds wonderful. I love the deep red of pomegranate seeds, I'm sure they would have been delicious in my oatmeal coconut cookies yesterday! I love pomegranate arils! I am going to have to try the arils with nutella soon! Nicole those look amazing! Love the lemon & pom combination! I might have to make these for dinner because I don't think I can wait for breakfast! LOVED meeting you this weekend. Can't wait to do it again! Mwah! Those little "rubies" look lovely on pancakes! I've used the juice a few times, but really want to try to incorporate some arils into a few recipes too. Thanks for the linky love! Hope you have a wonderful week. You are so creative with lemon! I don't think I've ever thought of lemon pancakes! Sounds good too. can't wait to try this. Glad I found your blog I am from the central valley too. Thanks for sharing! Hi! I found your blog from a link on Bloom's blog. I am so very excited to find out that you live in Fresno! It isn't very often that I find a blogger that is in my "own backyard"! I live in Exeter. I am loving your blog and recipies. My toddler loves eating pomegranate seeds. I can't wait to use some of your ideas to incorporate them in our food! Such a mouth-watering pictures! I love pancakes (despite the fact that I have not yet reached perfection in their cooking). But I use different recipes and try make ideal pancakes, the last one was this apple pancakes recipe http://cookiteasy.net/recipe/apple-pancakes-58418.html. By the way these pancakes are with lemon juice too. Thanks for your recipe, I'll try it to use!